For an average three-to-five register retailer, employees spend 15 hours per day managing cash. A national retail employee spends two or three times as many hours on cash-handling activities. The average bank note is touched a minimum of five times within your store before it is deposited. Most often, two employees are required to count all money exchanges in store throughout the day. In the day-to-day activities of running your retail business, have you ever stopped to determine the cost of handling cash? You may be amazed to see exactly what the cost is to your business. 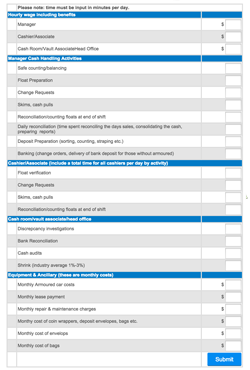 Fill out the form on the right and take a few minutes to find out using this free Cost of Cash Calculator and then let CashTech show you how to achieve a solid return on investment by implementing a cash management solution.